A couple of years ago, Chris and I were blessed with a trip to Italy with my family. Several of you know the story - we left one of our bags in Rome by accident...the bag with my birth control...and we came home with a permanent souvenir...Mason! Well, I was quite determined that the same scenario would not occur this time. So, being extra careful, I thought it through and decided that the best place for my birth control was in the diaper bag, because I always have that with me. I wouldn't have to worry about losing it that way. So I put it in the side pocket and forgot all about it. I briefly toyed with the idea of taking another set and putting it in the suitcase - just in case, but quickly dismissed that idea as ridiculous and put it all from my mind. Chris was on call the night before we left, so I was busy all day trying to get the last minute things packed and ready to go. When he got home, we had several hours before we had to leave, so he was going through some things, making sure that everything was ready. He decided that we had too many carry-ons and that we should put some together in an effort to save room, etc. So we hurriedly transferred everything from the diaper bag to a larger bag...everthing, that is, except the contents of the side pocket. 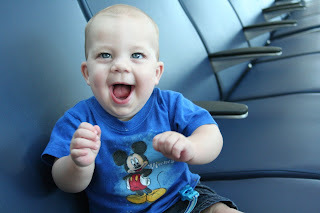 After we got to the airport, we had a very uneventful check-in (except that the lady helping us check in didn't know how to do an infant in lap ticket, so it took like an hour! ), but security went very smoothly. I decided travelling with two parents is soooo much easier than by myself. Much more preferable, for sure. So we were at our gate with plenty of time. 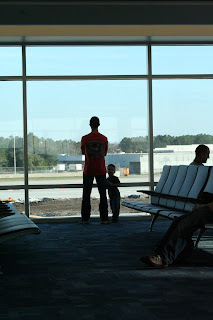 Chris took Grant over to see the planes, and I entertained Mason for a while. While we were sitting there talking, I had a terrible revelation and began chuckling...I, once again, despite my attempts at great responsibility, was missing my birth control. Oh, brother! If this is any indication of the trip to come, we're in trouble! We both laughed about our mishap for the rest of the week. I can assure you, however, we have no souvenirs this time except the ones we bought! !